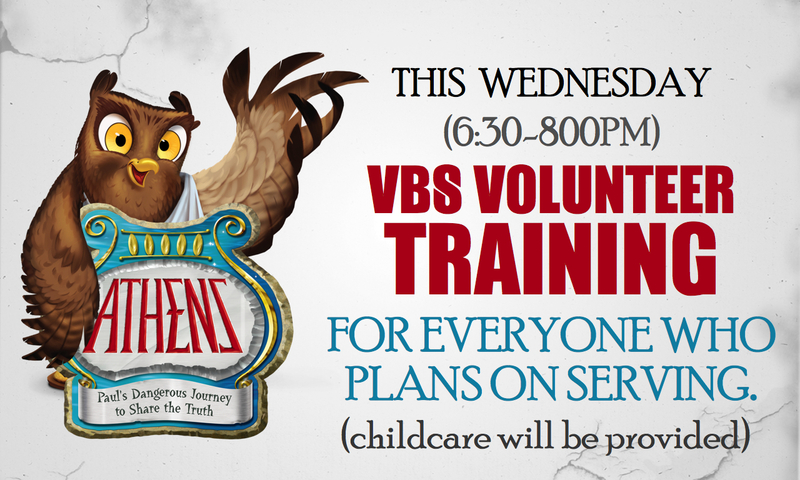 BCC: Help Make VBS Happen!!! There are only 12 days until VBS! Can you believe it?!?! We are so excited to see what God has in store for all of those who come and for all of you who serve. We still need you! Take a look below at the opportunities to help Athens come to life. Thank you ahead of time for investing your time and gifts telling the Good News to the children of our community! VBS is just around the corner and we appreciate all you who have been donating supplies! More are still needed though, and you can find those taped to the column in the Welcome Center. In addition to that, listed below are some things we'd like to borrow, and some everyday items that we need your help collecting. Bring them by the Welcome Center any day the office is open! If you are letting us borrow tarps, tents, lights, etc., make sure you label them with your name and number so we can get them back to you! We know that many of you would love to serve at VBS, but due to work you can't. We have just the place for you to serve! We need hands to help set up Athens on Saturday and Sunday (June 8th and 9th), as well as breaking down. Please contact Chris at chris@brevardcommunity.org if you can be part of this team. If you cannot attend this training, please attend the training this Sunday, June 2nd from 2-3:30.